If you cherish your books, why not mark your place with something nicer than a sticky note or a piece of junk mail? 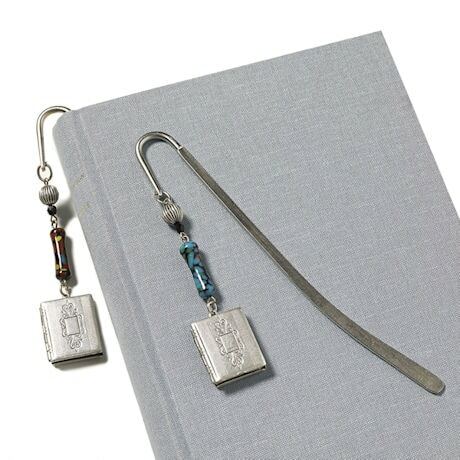 Handmade of silver-plated brass, this graceful bookmark slips snugly between the pages, and a lovely decorative accent—featuring a vintage Japanese glass bead and a prettily etched bookshaped locket (that really opens! )—dangles daintily over the spine. It's like jewelry for your reading material! 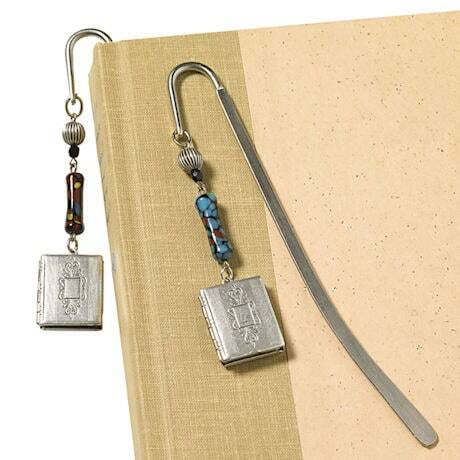 What a nice gift for a fellow bibliophile. Choose from two color schemes for the beads: bright Aqua or muted Rust.